Now Geophysic True Second Universal Time had been added to my collection. And Chicago is the first destination of my trip with my new partner. How do you like the size? How does it compare to some of the more classically sized JLCs you own? 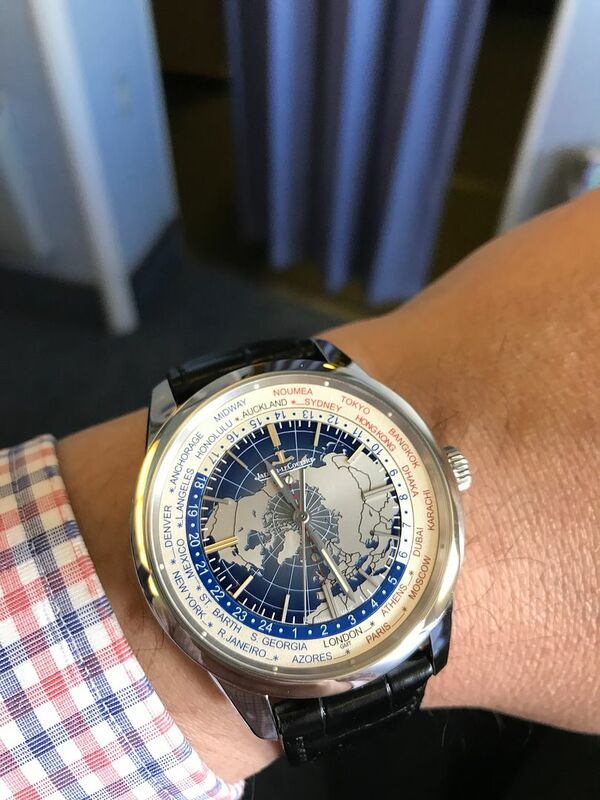 I find how Universal Time is large when I compare it with my Geophysic 1958 side by side, however, I do not feel it is oversized for me on my wrist partially due to its complicated dial design and blue-lacquered treatment. I love both 34mm simple classic Ultra Thin and 41.6mm detailed Universal Time. Thanks for the feedback. It does visually appear smaller than its measured size due to the dial treatment. Is the wearing comfort good too? It seemed perhaps a bit thick on my 18 mm wrist, but I'm still deciding whether to get one. LOL. An 18 mm wrist just might be a bit overpowered by any watch. Next Topic: New dive watches from JLC?